Another new 3D printing company is on the scene. As of this week the Rize team is officially out of stealth mode, a milestone the company has been working towards since their founding in 2012. With a slew of additive manufacturing patents expiring over the last few years the competition for new machines has been fierce and to succeed something unique is required. There are a few areas of improvement possible, speed, ease of use, but also importantly in innovations not directly related to the printer hardware, that being in the software and the actual materials to be printed. 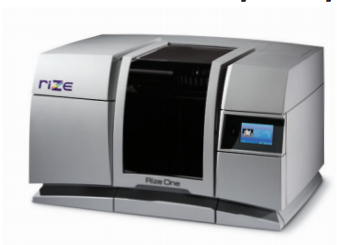 The Rize One is an FDM (fused deposition modeling) machine billed as an office compatible desktop system. Starting at nearly $20,000 for a machine you can expect that will not just be any old desk. For Rize the potential innovation is in the material which, according to their press releases, allows for significantly reduced post-processing time by “eliminating time-consuming support removal and producing a usable part 50% faster than other systems.” The improvement is done through the use of, at this point, three independent materials. The proprietary Rizium One is the base thermoplastic of the part while Release One is a repellant that is jetted between the designed part and the support structure making it easier to break away. Marking Ink is also available which adds the ability to drop on simple logos and text, a process that is cumbersome on alternate machines, as it often must be done by hand painting. Some other noted features are simply those of the additive manufacturing market in general, reduced time to market, cut costs, and streamlined operations but at least one, an improved software algorithm that allows for printing of imperfect files, holds some promise. Still the industry has been burned by lackluster features over the past few years, the hype-cycle for 3D printers seemed to peak in 2013-2014, and it will be tough for Rize to fight through with competitors touting similar advances. Anyone who has spent time with a 3D printer knows that the complexities of preparing a file and the actual operations of the machines can detract from the above listed features. That is why it is worth noting that the team behind Rize is no joke. The founding team includes decades of experience at other leading companies including Autodesk’s Revit, ZCorp (who was acquired by 3D Systems) and Objet (who was acquired by Stratsys). Time will tell if the team can deliver on all of their promises but with a slew of experienced professionals and testimonials from big names, including Reebok, Rize at least stands a better chance than the countless Kickstarter projects touting lackluster features.